5-BR 4-bath, room for everybody, spitting distance to the lake and beach. 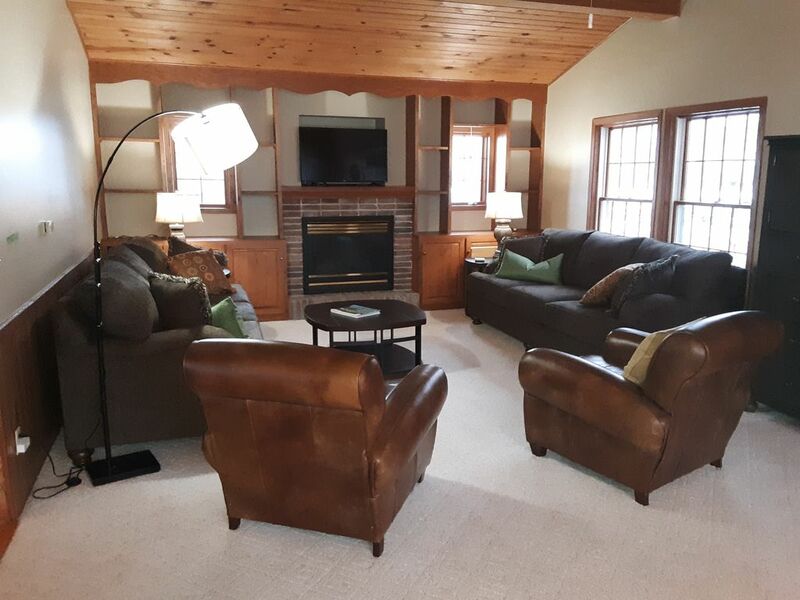 5-bedroom 4-bath spacious home directly across Park Street from Lake Pepin, the beach, the park and the marina. Lots of room to spread out with your extended family; comfortably sleeps 16; relaxing open indoor and outdoor spaces; incredible views of the lake; right in the middle of all the Lake City area has to offer - boating, fishing, skiing, golfing, hiking, biking, bird-watching, picnicking, or just lying on the beach. At the end of the day, gather in the large living room with gas fireplace and Smart-TV, or around the table in the game area. Bring your own games, or enjoy the classics in our game cupboard. Or in the summer, gather out front to enjoy the quiet patio, and the beautiful sun rises and sunsets across the lake. The dining table easily seats 16. The kitchen is stocked with all the basics you could need and more. There is a small wet bar for refreshments. And a gas grill on the back patio for outdoor cooking. You will sleep in the wonderful comfort of all new Casper mattresses, with Minnesota s own My Pillow pillows and mattress toppers. Master bedroom has a queen bed, a twin daybed and twin trundle, plus en suite bath and a fantastic porch with beautiful view of the lake, plus its own private laundry area. Second bedroom has one queen bed; third bedroom has two queen beds. Both have a beautiful view of the lake and share the hall bath. Fourth bedroom has two twin beds, and shares another hall bath. Fifth bedroom has a queen bed, twin daybed and twin trundle, and its own en suite bath. There is a second larger laundry area on the main floor, and a linen cupboard with extra sheets and towels, including beach towels. Recent upgrades include: high speed wireless internet, with boosters to make sure the entire house is covered; state-of-the-art reverse osmosis water filtration system for great drinking water; tankless water heater for endless on-demand hot water - no need to fight over who gets to shower first because the hot water never runs out! Our family loves to vacation together. We gather from Minnesota, South Dakota, Iowa, Missouri, Colorado and Texas every summer. A couple years ago, we "discovered" that Lake City and Lake Pepin have something for everyone - all the outdoor fun we can handle, boat launch right in the middle of town, plus the park and the beach for us to make up our own fun and games. We feel so lucky to be able to hold on to a little piece of it. We have outfitted the house with all the gear and conveniences that we like to have on our vacations. And we look forward to ideas from our visitors to make sure the lodging is as wonderful as the location. Two spots in the driveway; street parking. Bath towels, hand towels, dish towels, beach towels. Huge table easily seats 16. Growing collection of classic games. Front patio with incredible view of the lake, the river, the beach and the park. Overlooking the lake, the river, the beach and the park. Front yard patio; porch off master bedroom. Waterskiing, of course. Lake City is the birthplace of waterskiing! Beautiful house on Lake Pepin. Very impressed with the Chestnut house. Very nice kitchen with a large table which we spent a lot of time at.The house is in excellent shape with a beautiful view of the lake. We would stay here again. We had a wonderful time at Chestnut House, very nice house, lots of room, well maintained, great location, beautiful views, highly recommended. I love this place, perfect place to enjoy with you love ones ..Specially in winter , super location and luxury property..